Camp Tilikum | Tilikum is a place where people can go to experience creation, build community, find refuge, encounter God, and see lives transformed. Christian day camps Summer Day Camps for K-8 and overnight options for high-school. …Summer Camp with your kids. Week long camp vacations with your kids for a maximum of $800! Parent & child faith-based weekend programs throughout the summer. …for gathering friends, associates, and groups. Lodging, meeting space, and home-cooked meals for up to 58 people. Corporate and non-profit team-building and outdoor adventure facility. What people are saying about Camp Tilikum. Every year more than 7,500 people come to Tilikum to find rest and renewal among the 93 acres of rolling hills, dense forest and pristine lake. We believe every child should have the opportunity to go to camp, whatever their socioeconomic status. Consider giving to the Tilikum Camp Scholarship Fund and make a difference in the life of a child this summer. You can make a difference in the lives of others. Support the ministry at Camp Tilikum. 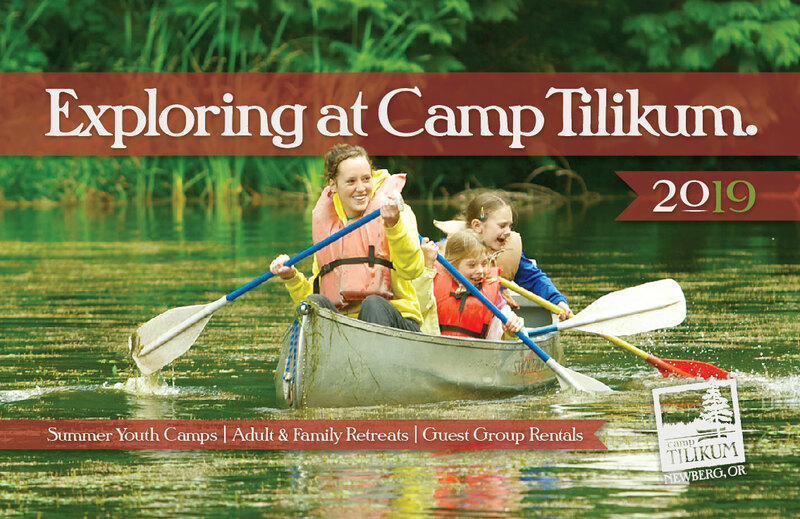 Click on the picture above to download the Camp Tilikum 2019 brochure.